We thought we’d update you, our lovely fans, on the latest of our adventures. As some of you probably know, we are planning a full season of Travel by Dart in 2016: 12 dart throws, 12 countries, 12 weeks, all resulting in 12 episodes! We cannot be more excited to get excited an empowered people all around the world to live their lives by taking a leap of faith. Meanwhile, we can’t wait to change lives with the support of our amazing partners. You’ve asked many times by you what countries we would love our dart to hit- where would we like to go next? While Sorin prefers Argentina and Matt wants to help people in Sierra Leone, both secretly have a common denominator when it comes to an ideal location: Thailand. Sure, party in Thailand is great, but we also want to see a different Thailand. We want to explore it. We dream about it. 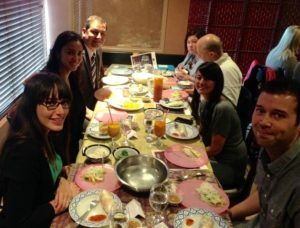 That’s why the invitation to attend an event called Amazing Thailand organized in Edmonton, Alberta, caught us by surprise. What is the Trafalgar’s 2016 Asia Program? Amazing Thailand was put together by Trafalgar Canada (represented by The Travel Corporation) along with the Tourism Authority of Thailand and took place at the Syphay Restaurant. Trafalgar is one of the most renowned travel companies in the world and the event hosted on September 21 marked the official launch of Trafalgar’s 2016 Asia Program. What a beauty this program is. From enjoying a hands-on cooking class in Myanmar to joining a local family for dinner in Japan, the 2016 Asia program also offers a series of once-in-a-lifetime opportunities, such as dining in a royal historical home in Vietnam, visiting a primary school in Chiang Mai, or joining a traditional oil lamp lighting ceremony in Yangon. However, as the title of the event clearly stated, Thailand is the top of the list, as Kayla Shubert (Representative for Canada at Tourism Authority of Thailand) and the team coming down from Toronto introduced to the audience. #TrafalgarCares is the hashtag that caught our attention as well. As our mandates align, we looked into finding out more about the company. “Trafalgar is our biggest brand. Its doing a phenomenal job and I can’t be any happier when I see people loving the company and re-booking only to have the same experience again. That tells a lot about the brand” says Marie Anne MacRae, Global VP Strategic Partnership at The Travel Corporation. Trafalgar is running special prices for Thailand trips next year but needless to say, we sure want one of our darts to hit Thailand. Soon. Trafalgar and Thailand make a good pair. The warmth of the Thai people, delightful culinary adventures and beautifully ornate temples will have guests traveling to Thailand time and time again. Trafalgar (www.trafalgar.com), invites travelers to uncover an even more in-depth trip of Thailand with its famous Insider Experiences. Trafalgar’s Thailand guided vacation gives guests a deeper appreciation of this destination’s wonderful people and charming culture. They will travel in smaller groups with no more than 26 guests with the services of an expert bilingual Travel Director. As an added value, travelers will enjoy daily breakfast buffet and up to 50 per cent of their evening meals. The 2016 Asia program offers three itineraries to discover Thailand and its surrounding regions including the 10-day Treasures of Thailand, 13-day Treasures of Thailand with Cambodia and the 14-day Secrets of Myanmar with Bangkok. “As a top bucket list destination for travelers, Thailand has something for everyone from savoury food, stunning landscapes and wonderful beaches,” says Wolf Paunic, president of Trafalgar Canada. “Canadians have always had a fascination with Thailand and we are thrilled to be expanding our itineraries to accommodate this heightened interest and adding even more authentic Insider experiences.” Guests can save up to 10 per cent across Trafalgar’s new 2016 Asia program with Early Payment Discount* of up to $1576 per couple available when they book and pay in full before November 19, 2015. This 10-day in-depth guided vacation includes all internal flights and showcases the diversity of this exotic destination from the sacred temples and tuk tuks of Bangkok to the lush forests of Kanchanaburi and ancient traditions of Chiang Mai. Guests will spend four nights in Bangkok, two nights in Chiang Rai and three nights in Chiang Mai. The Cultural Insights on this itinerary are abundant and include learning T’ai Chi in Lumpini Park, discovering the cultivation process of coconut palm sugar and enjoying a Thai massage at Wat Pho, Bangkok’s oldest temple. Guests will explore historical Kanchanaburi with a visit to the War Cemetery as a final resting place for 6,000 Allied prisoners and board the local train at the world famous Bridge over the River Kwai. In the Golden Triangle area of Chiang Sen, they will transfer to a boat and cruise along the Mekong River with a stop in Laos and visit the Don Sao Island Markets. A new 2016 Insider experience for travelers includes visiting a primary school in Chiang Mai. Guests have the opportunity to interact with children from ages 3-12 years of age from the Hmong and Lahu tribes. Part of the Trafalgar Cares program, this visit helps provide essential supplies the school needs. In Chiang Mai’s Old Town, guests will stay at Authentic Accommodation, the De Naga Hotel, which is an excellent example of the exotic Lanna style of architecture. A wonderful and exclusive experience is the Be My Guest lunch in Ban Mae Kampong. After a village tour with one of the locals and observing the making of handicrafts, guests visit the house of the village chief who will chat with the group and answer their questions. This visit, also part of the Trafalgar Cares program, generates income for the village and goes to fund welfare programs, ranging from infrastructure to forest conservation. Trafalgar is also offering special Solo Traveller Discounts with reductions on the single supplement on selected dates on all Asia itineraries. Past passenger discounts of 5 per cent per person (land only) are also available for travelers who have previously traveled with The Travel Corporation’s family of brands. To find out more information, visit www.trafalgar.com.